"A Clunky Comedy with a Few Fun Moments"
OVERBOARD (2018), a remake of a 1987 comedy, tells the story of a stressed, broke single mother with three daughters who tricks a spoiled billionaire into believing he’s her husband after he suffers amnesia after he falls from his yacht. Viewers have to suspend all their disbelief to enjoy this mostly-clunky comedy with a few laughs inserted haphazardly. Also, despite having less foul language, this OVERBOARD contains some crude humor, partying and significant morality problems, so it’s unsuitable for children, while older viewers will want more depth and better character development. 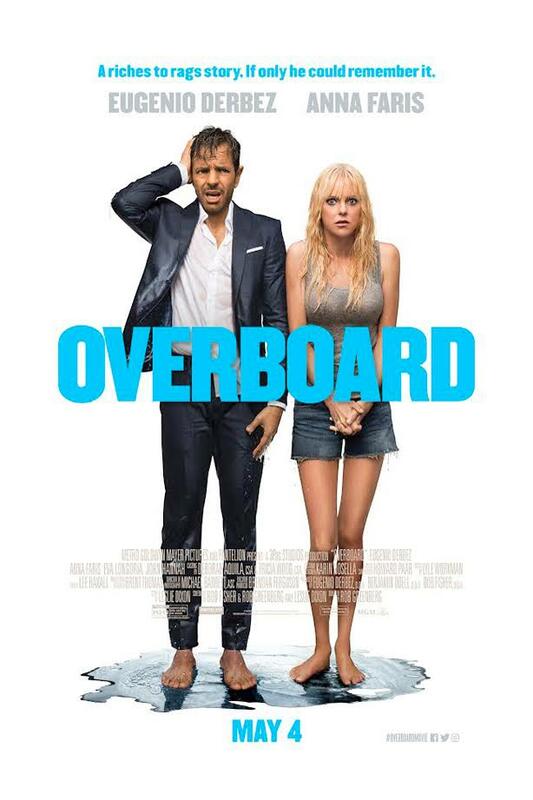 OVERBOARD (2018) tells the story of a stressed and broke single mother Kate (Anna Faris) who tricks spoiled billionaire Leonardo (Eugenio Derbez) into believing he’s her husband after he suffers amnesia from a boat accident. Although the roles are reversed in this remake of a classic comedy, the plot still worked much better in 1987. Viewers must suspend all their disbelief in order to enjoy this mostly-clunky comedy with a few laughs inserted haphazardly. Earning its PG-13 rating through some crude humor and partying scenes, the content in OVERBOARD is unsuitable for children. The movie’s opening sets the stage for a character in immediate need of some transformation. Leonardo is the son of a billionaire who spends all his time partying on his multimillion dollar birthday present of a yacht. Girls in bikinis and champagne abound in his dream life free of all responsibility. Leonardo’s “perfect” life is in stark contrast to Kate, the single mother of three girls who’s desperate to find time to study for her nursing exams between working three terrible jobs. One of Kate’s terrible jobs is cleaning Leonardo’s yacht, where the two meet and don’t get along so well. In fact, Leonardo dislikes Kate so much he fires her on a whim. When she refuses to leave the boat until he pays her, he pushes her into the water. Later that night, after too much to drink, Leonardo falls off the boat himself. Leonardo washes up on the Oregon shore with complete amnesia. He has no memory of his name, his wealth, or his past. His visiting sister is the only person who can verify his identity, but she also wants to inherit the family business from their dying father. Seeing that Leonardo stands in the way of her success, she refuses to identify him and instead tells her family that Leonardo has been eaten by a shark. Meanwhile, Kate is at the end of her rope after receiving an eviction notice. She reads an online article about a “mysterious man with amnesia” and recognizes him to be Leonardo. Desperate for cash and help around the house, Kate decides to convince Leonardo he’s her husband for the next month, just until her nursing exams are over. Kate’s plan goes great at first as Leonardo settles into a life of domesticity. He cooks, cleans and even goes to work for one of Kate’s friends. She couldn’t be happier about the free time and ability to study, and it turns out that Leo is actually a pretty great guy once you take him away from his yacht and all his money. As Leo grows closer to Kate and her daughters, Kate finds it more and more difficult to tell him the truth. However, it’s only a matter of time before Leo’s family discovers he’s alive. Anyone buying a ticket for OVERBOARD will hopefully know what to expect already: a screwball comedy with a plot that unravels as soon as you start asking questions. It would be almost impossible for Kate to pull off a con of this scale without anyone noticing, yet no one seems to bat an eye at the sudden appearance of a “long lost husband”, who was never there in the first place. Viewers would be less inclined to ask logistical questions if the movie had a more substantial emotional core. The dialogue is forced and clunky, making the characters seem out of place and unnatural. Anna Faris, who can really shine in the right role, isn’t given much to do here, so it’s difficult to sympathize with her character. Also, Kate doesn’t seem to change at all. Her actions are deplorable throughout the movie, and yet she never really receives any consequences for them. Other than the simple motivators of money and revenge, it’s very hard to sympathize with a character who kidnaps a man and makes her three young daughters accomplices to the crime. In contrast, Leonardo is given a full character arc, transforming from a spoiled billionaire brat to a hard-working, selfless father of three. This issue leads to some significant worldview problems. While Leonardo’s lesson is, “Love is better than money,” Kate never learns any lessons. She lies, steals, kidnaps, and coerces her kids, yet still gets love and money in the end. It’s very difficult to see why Leo loves her. While there are some laughs along the way, these oversights in characterization culminate in an emotional ending that the movie never earns. Morality problems combined with some crude humor are not ideal for young viewers, and older ones will want more depth and better character development from OVERBOARD. The plot hinges around a main character getting away with kidnapping, lying, and coercing her children to do the same. OVERBOARD (2018), a remake of a 1987 comedy, tells the story of Kate, a stressed, broke single mother of three who hits the end of her rope after receiving an eviction notice. In a desperate attempt at wealth and revenge, she tricks Leonardo, a spoiled billionaire, into believing he’s her husband when he suffers amnesia after falling off his yacht. Leo turns out to be a great help around the house. As he grows closer to Kate and her daughters, Kate begins to fall for him and finds it more difficult to tell him the truth. However, it’s only a matter of time before Leo’s family discovers he’s alive. Viewers will have to suspend all their disbelief to enjoy this mostly-clunky comedy with a few laughs inserted haphazardly. There are also significant moral issues with this new OVERBOARD movie. For example, Kate lies, steals, kidnaps, and coerces her children, but still gets everything she wants. These morality problems in OVERBOARD, combined with crude humor and innuendo, are not suitable for young viewers. Older ones will want more depth and better character development.